Report on the historic 500th Anniversary RMS St Helena Cruise to Tristan da Cunha February 2006. Celebrating the discovery of Tristan da Cunha by the Portuguese Admiral Tristao da Cunha in 1506, this historic cruise is described in outline below and there will be a full report with many photographs in the July Tristan da Cunha Newsletter. Make sure you are a member of the Tristan Association to receive your free copy. See Tristan Association Membership Page. The RMS St Helena arrived back in Cape Town to end the Quincentenary Cruise. The RMS St Helena visited Gough Island on its return voyage to Cape Town. Six members of the 1955/6 Gough Island Scientific Survey led by Tristan Association Chair Michael Swales and Vice-President Sir Martin Holdgate and also including John Heaney, Dr Robert Chambers, Dr Roger Le Maitre and Philip Mullock were able to celebrate an emotional return to Gough to mark the 50th Anniversary of the expedition. Unfortunately neither the Goughalites nor Governor Clancy were able to land and the visit was limited to a circumnavigation of the island and radio conversations with the South African Team based at the Meteorological Station. Photograph right showing RMS St Helena Cruise passengers being ferried back to the ship from Calshot Harbour on Saturday afternoon, and left the RMS sailing away, (hopefully not for the last time), for a trip around Inaccessible and Nightingale Islands before cruising overnight to Gough. Governor Clancy attended a meeting of the Island Council during which Sarah Sanders of the RSPB outlined the Royal Society’s continuing interest in the Tristan group of islands because of their world importance for seabirds and their support for the project to try to eliminate rats and mice. Andrew James, representing Ovenstones fishing company set out the economics of the fishing operation and ideas for trying to restrict illegal fishing. Governor Clancy referred to words from Her Majesty the Queen’s Anniversary message to Tristan and underlined the continuing commitment of the UK Government, as demonstrated in his announcement about a decision to support the Calshot Harbour rehabilitation. The Governor also presented to the Chief Islander, Anne Green a boxed `set of engraved silver ingots. He hoped that this set of 50 ingots depicting the monarchs of England from King Edgar to the present day would be appreciated by the island community as a memento of their 500th Anniversary. Symbolically he saw each ingot as representing a decade since Tristan’s discovery and the overall theme indicating the link between the island and the UK. In the evening Governor Mike Clancy hosted a reception which was followed by a dance to celebrate Wayne Swain's 18th birthday. This day was declared a public holiday to formally celebrate the Quincentenary of Tristan da Cunha. 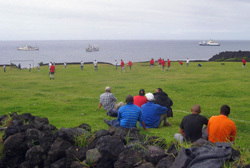 Morning sports included a married v single football match (The Tristan v RMS St Helena Crew game was cancelled owing to poor weather stopping ferry journeys to the ship), a school sports day followed by an adult game of the unique Tristan 'football-rounders'. Governor Clancy had lunch at the home of the Chief Islander, sampling the local delicacies stuffed roast mutton ,crayfish pie and clouttie dumpling. I take this opportunity to congratulate you, the Community of Tristan da Cunha, as you celebrate the quincentenary of the Island’s discovery in 1506. You are descendants of William Glass of Kelso in Scotland, who remained behind on the withdrawal of the British garrison established on Tristan in 1816, and of other settlers in those early years who chose to join one of the world’s most isolated island communities. You have inherited their legacy. This includes the responsibility to use natural resources wisely, and to preserve a healthy environment on an Island group globally important for large populations of seabirds, and containing some of the best preserved marine and land ecosystems in the cool temperate zone. You have a reputation for sturdy independence, and self-sufficiency. Despite the setbacks, including the dark days of the 1961 volcanic eruption when the entire population was evacuated to Britain, and more recently the severe storms in 2001 which damaged so many family homes, you have remained steadfast and true to the proud motto on the Tristan crest: ‘Our Faith is our Strength’. For the future, as improved communications and other advances bring your Community closer to families and loved ones overseas, may you continue to enjoy a life of peace and tranquility in your unique island home. At the dance held in the Prince Philip Hall to celebrate the 500th Anniversary of the discovery Tristan da Cunha, Sarah Sanders, representing the RSPB presented Chief Islander Anne Green with a new Ordinance containing Environmental Protection Laws. The photograph left shows, right to left, Governor Mike Clancy, Head of Natural Resources Department James Glass, Chief Islander Anne Green, Sarah Sanders of RSPB and Tristan Administrator Mike Hentley. Also at the dance, Chair Mike Swales presented a specially commissioned plaque to mark the 500th Anniversary on behalf on the Tristan Association. He also presented a cheque representing the Association's contribution to the St Mary's School Hall refurbishment and new science lab project. In return Mike was presented with two Tristan flags to display at Association meetings. Five hundred years after the discovery of the South Atlantic islands of Tristan Da Cunha, the unique wildlife of the UK Overseas Territory will receive greater protection, thanks to a new Conservation Ordinance. 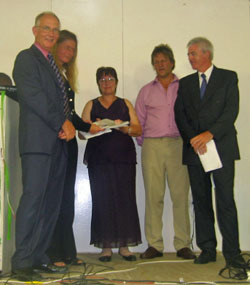 At a ceremony, on the 9th of February, celebrating the 500th anniversary of the islands' discovery, His Excellency the Governor of St Helena and Dependencies, Michael Clancy, presented the new ordinance to: Mr Mike Hentley, the islands' Administrator; Mrs Anne Green, the Chief Islander; and Mr James Glass, Head of the Tristan Natural Resources Department. 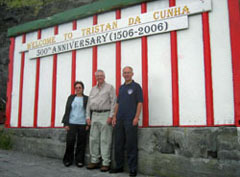 The author of the ordinance, John Cooper, of the University of Cape Town and a Tristan honorary conservation officer, said: "We hope this ordinance will take the environmental protection of Tristan da Cunha and its outlying islands into the first half of the new century: it really is a major achievement. Among many other matters, it results in the creation of seven new reserves for rockhopper penguins on the main island of Tristan. The Islanders should be proud of their conservation achievements that this new ordinance marks." An Elvis tribute provided by Rikki Ryan, above, provided music for the dance. Rikki has been raising funds to provide a new sound system for the Prince Philip Hall. He is the son of Noeline Evans (nee Swain). Record Number of Overnight Visitors ? During RMS week, a total of 70 RMS passengers stayed all 6 nights ashore, another 31 stayed 5 nights or less, in addition to 24 relatives/friends/visitors/officials who came on the Kelso/Edinburgh. So the total resident population of 271 plus 8 ex pats peaked by a further 125 at one stage - with one visitor was sleeping in his tent in the factory manager's garden! The fishing vessel MV Kelso provided an opportunity for 47people, including Governor Mike Clancey to go ashore on Nightingale Island and enjoy a circumnavigation of Inaccessible Island. The full day trip lasted from 10 am to 10pm as it took many journeys to ferry passengers to and from the rocky landing on Nightingale. Governor Mike Clancy toured Government Departments in the morning and also toured the Museum and Craft Shop. After a working lunch with representatives of Ovenstones Fishing Company Mr Clancy attended an Island Council Fishing Committee Meeting. In the evening Chief Islander Anne Green hosted a Reception in honour six visiting members of the Gough Island Scientific Survey, celebrating their own 50 year anniversary. 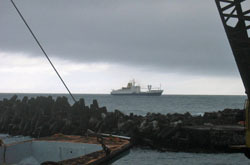 In the morning Governor Mike Clancey toured the Crawfish factory and also went aboard the fishing vessels MV Edinburgh and Kelso, anchored off the Settlement with the RMS St Helena (see photograph below). At 2pm the Governor joined a packed school hall for 31 St Mary's School pupils to perform their production 'The Pied Piper of Tristan', also featured in more detail on our Community News Page. After the concert a unique football match provided afternoon entertainment when a team from the fishing vessel MV Edinburgh (who kept one of the cargo holds empty on the outward journey and held daily training sessions) played a Tristan Team (from the Settlement of Edinburgh). The photograph shows the match, played on American Fence below St Mary's School with MV Edinburgh, MV Kelso and the RMS St Helena at anchor. tristandc.com understands the visitors won by a narrow margin not exceeding the number of their players! We also understand the FA have approached Ovenstones Ltd for details of their unique training schedule and may make an approach for the vacant England manager's job after the World Cup. Mike Hentley, Tristan's Administrator hosted a Reception at The Residency which included a toast to 500 Years of Tristan History and afterwards most of the island community and the many visitors attended a dance in the Prince Philip Hall to celebrate Maria's timely 21st Birthday. The RMS St Helena arrived on the morning of Sunday 5th February on its special quincentenary year visit bringing a total of 114 passengers. Despite the overcast sky and stiff breeze, the disembarkation process went very smoothly. 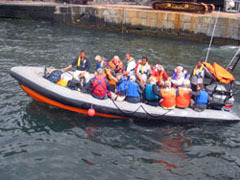 Many passengers are planning to stay ashore for one or more nights, and nearly every Tristan household is hosting guests. One enterprising passenger has even pitched his tent in the Factory Manager's garden! Governor Mike Clancy being welcomed by Administrator Mike Hentley and Chief Islander Anne Green as he makes his inaugural visit to Tristan during the quincentenary year. The Governor carries a special 500th Anniversary message from HM Queen Elizabeth II which will be read at a Reception planned for Tuesday 7th February. It will be published on tristandc.com immediately afterwards. Monday 30th January RMS St Helena left Cape Town with 114 passengers for a five / six day passage to the Tristan Settlement of Edinburgh of the Seven Seas. Passengers are from all over the world, include the Governor of St Helena and its dependencies Michael Clancey joining Tristan Association members, led by Chairman Michael Swales. The RMS St Helena Cruise will test Tristan da Cunha's hospitality to its limits. Maximum Bed and Breakfast capacity is normally 40, but island families have made spare rooms available for the influx of passengers on the RMS. Tristan da Cunha has no hotels or inns, but there are two guest houses and islanders offer full board to occasional visitors. Normally passengers from passing ships are not allowed to stay overnight as weather conditions change quickly and they may be marooned.